Imagine yourself driving a truck for countless hours down the highway in the middle of the night. The radio may be your only connection with technology at that time, and you’re taken away from marketing your own business because you need to keep fulfilling orders. This is the life of a truck driver. Not only are truck drivers not going to have the time to develop a website, but they may not have the know-how. Therefore, logistics WordPress themes are extremely important in this industry. The themes on the market right know have various functions. Sure, they work for truck drivers who run their own little one- or two-truck companies. But they also serve larger companies in similar fields. Sometimes, these companies have web developers, while others are stuck to manage the websites themselves. Regardless, it’s nice to have a WordPress theme, since it doesn’t take much development knowledge. Displaying your services is the key to a quality logistics website. When a potential client comes to your site and sees that you offer transportation or trucking services, they want to know the types of materials you ship. Therefore, widgets, shortcodes, and buttons are essential for organizing these details. Forms and fields are required for clients to contact you, while it’s also nice to show some galleries or portfolios to intrigue your clients. We also think that a pricing form would serve you rather well. Who Might Find a Logistics Theme Useful? As we talked about in the introduction, truckers should consider selecting one of the themes below. We also like them for transportation and logistics companies. For example, some businesses actually speak with the truckers and coordinate the loads and destinations for them to go to. It doesn’t matter if you’re the desk jockey on the phone or the person handling the cargo, these are themes that can help you out. From air cargo to trucking or ocean freight, the options are endless. We think these are fabulous themes and that they represent some of the best on the market. Please let us know if you think we’ve missed any that should be added. 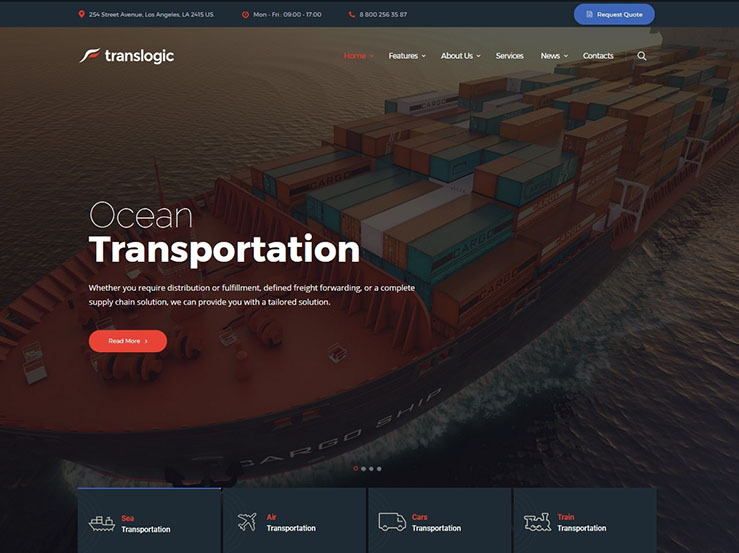 The Translogic WordPress theme is a great choice for logistics and transportation websites. 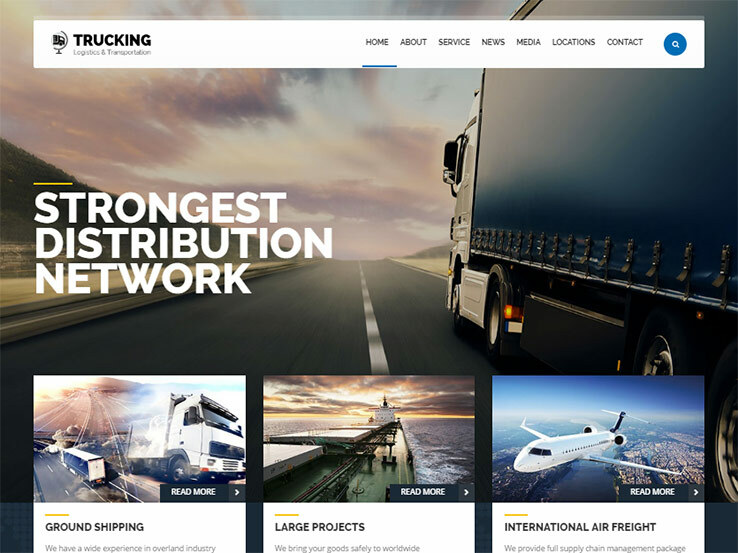 This template offers an elegant and professional design along with all the features you need to run a successful website for your logistics company. It features 2 homepage layout options, a large attractive full-screen front page slider that’s great for showing off photos of your operations, and strategically-placed forms for people to easily request a quote. You’ll even be able to display a “Request Quote” button at the top, along with your hours of operation, phone number, and address. Moreover, your clients will have a facility to track their freight online, which puts real-time status updates at the fingertips. The Translogic theme also includes sections for your services, team members, testimonials, and a portfolio. 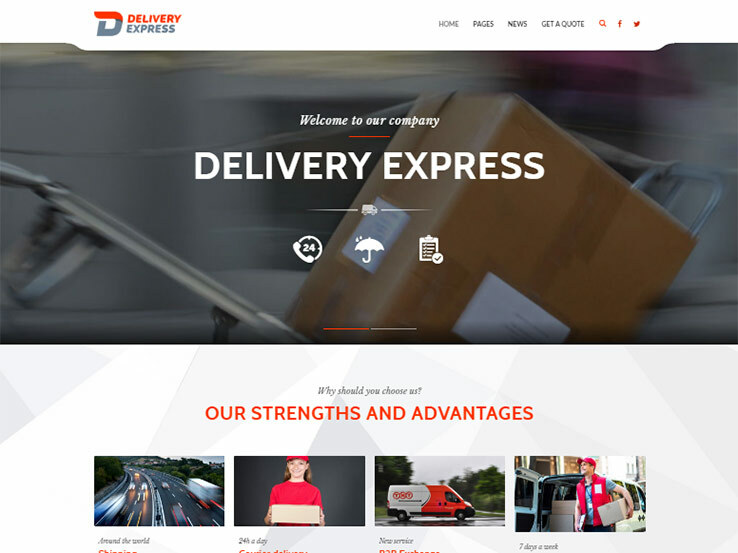 And with one-click installation, fully responsive layouts, lots of customizable options, and reliable support, this WordPress theme is perfect for any logistics website. 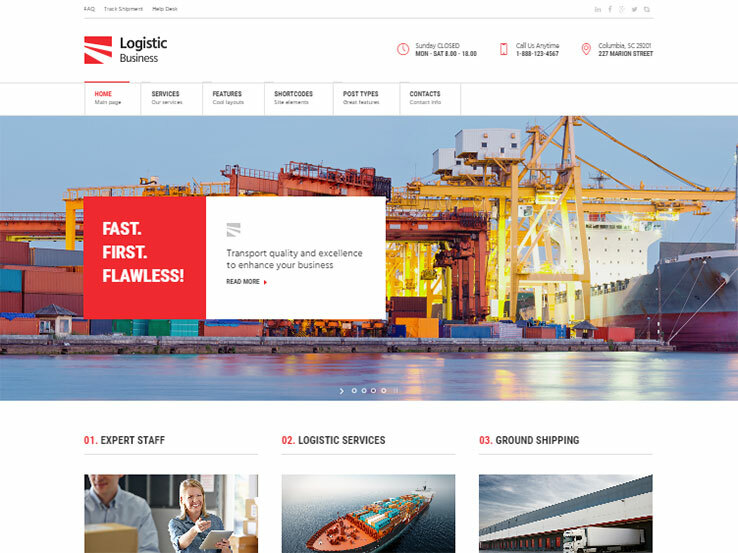 The Logistic Business WordPress theme serves companies that are looking for a more professional design. Social media buttons and contact information modules start off the homepage, and an area for tracking a shipment complements the help desk and FAQ section. The slider shows off some pictures of your operation, while the calculated fields form can be used for users to stop by and see how much a shipment is going to cost them. This theme provides a king-size shortcode pack with tables, social sharing, sliders, tweets, and more. The post types include masonry blog and timeline, and you receive unlimited color solutions for matching the site with your logo. Portfolio layouts allow for multiple columns and the mega menu boosts your chances of organizing multiple pages for all of your offered shipping services. Try out the Trucking theme if you’re an individual that delivers goods with your truck. We also like it for larger businesses that manage truckers. On the backend you gain access to a simple page builder module, and the one click install speeds up the development process. The responsive theme has hundreds of transportation icons, and the Google Maps section features multiple locations for sharing where your businesses are situated on the map. Both video guides and PSDs are packaged in for the ultimate support. Managing your typography is fairly easy while Contact Form 7 compatibility ensures you stay in touch with your customers. Feel free to change our background image and use the slider to reveal images of trucks or your office. The social media buttons are nice, and you get access to email marketing tools, a client logo slider, and a widget for testimonials. 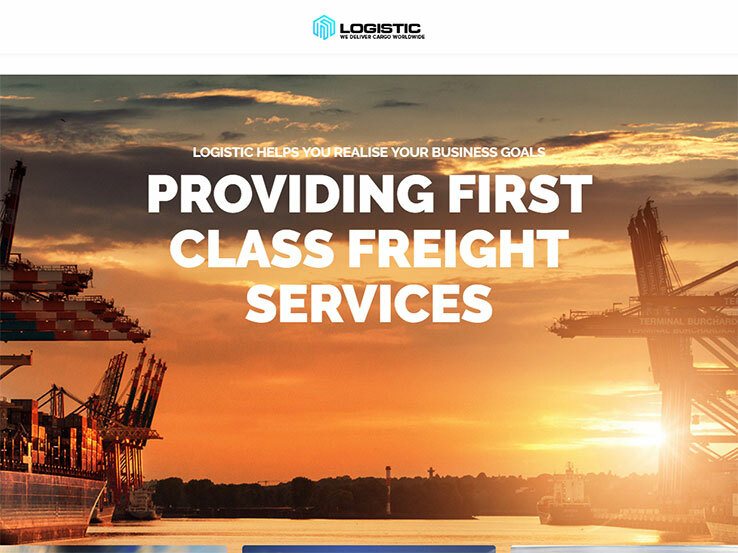 The LogisticWay WordPress theme is a product from the folks at InkThemes, and it’s a solid choice for warehousing, trucking, and transportation companies. Ten color variations come with your purchase, along with a responsive design and a pop-in menu on the side. The Awesome Slider plugin grabs attention from clients right from the start, and the custom templates cut down on your development time. The features section is what you would generally use to talk about your features and services and it’s a real standout. The theme provides a spot for inserting a company video, and you can feature photographers and descriptions of your staff members. The stylish portfolio gives customers a glimpse into your past work and the customer testimonials are bound to bring in more profits for your transportation business. We like the homepage blog section, since it shows featured images, titles, and descriptions. Not to mention, there’s a small slider for client logos. The Cargo theme presents a design for corporate logistics companies, as it uses a simple quote calculator for potential clients. The rapid composer on the backend minimizes the need for coding, and the over 25 header and portfolio layouts expand your use of imagery. Hundreds of page elements, icons, and Google Fonts are there for branding and grabbing attention, while the fully responsive layout allows for viewing on smaller devices. A translation file is included with the Cargo theme, making it easier for you to gain customers from all over the world. Keep in mind that the theme provides an unlimited number of grid columns, so if you’d like to share a custom portfolio, this shouldn’t be a problem. The extensive documentation and support is certain to guide you along your web design journey, while the child theme-ready nature of the theme gives you more flexibility for customizing. 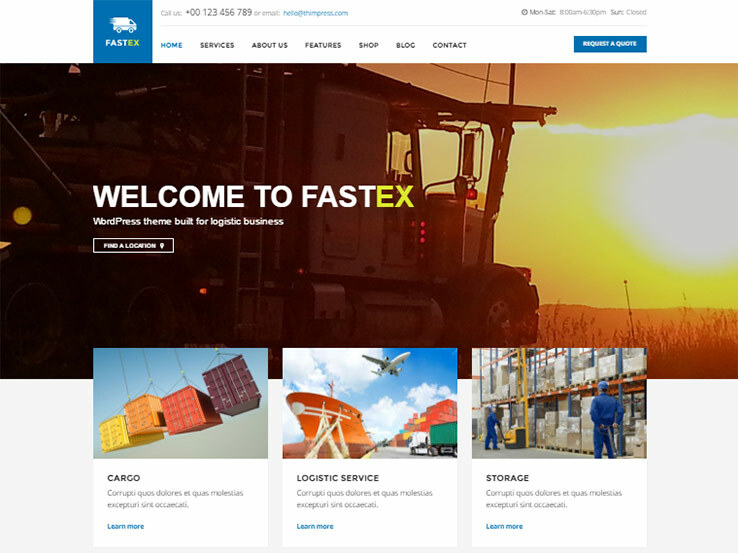 Another gem for logistics and transportation companies is called Fastex. This one has three homepage versions, each of which include stock content for transportation companies. You get two premium plugins: Visual Composer and Slider Revolution. You can also customize all of the icons on your site, making them fit with the logistics industry. The responsive Fastex theme also provides a form for customers to request quick quotes from your company. It also supports parallax scrolling. Combined with the unlimited colors and skins, you’re bound to make a lasting first impression with these design elements. Along with that, you get a drag and drop page builder, a one-page site option, and a one click installer. The live preview customizer cuts out the need to push the Preview button and MailChimp integration comes in handy when trying to collect emails from customers. This one is another win. 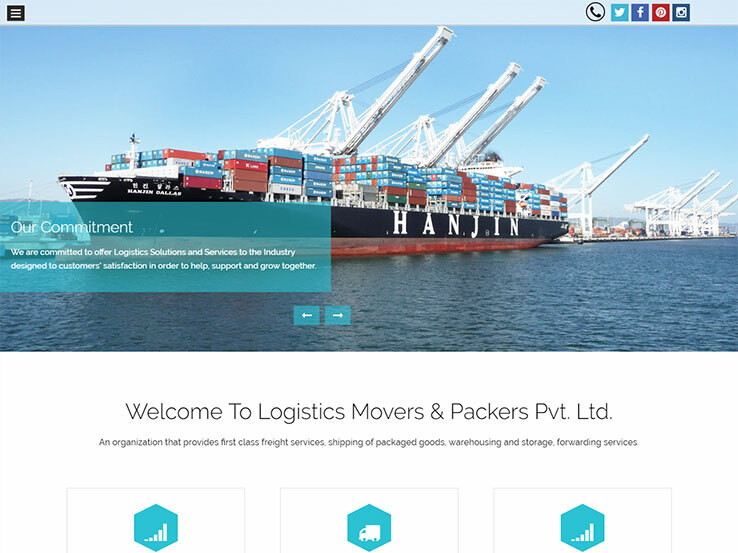 With the Global Logistics theme you can boost the online presence of either a warehousing or transportation company. The gallery layouts are there for showcasing any past projects, while the Contact Form 7 integration gives customers a way to reach out. 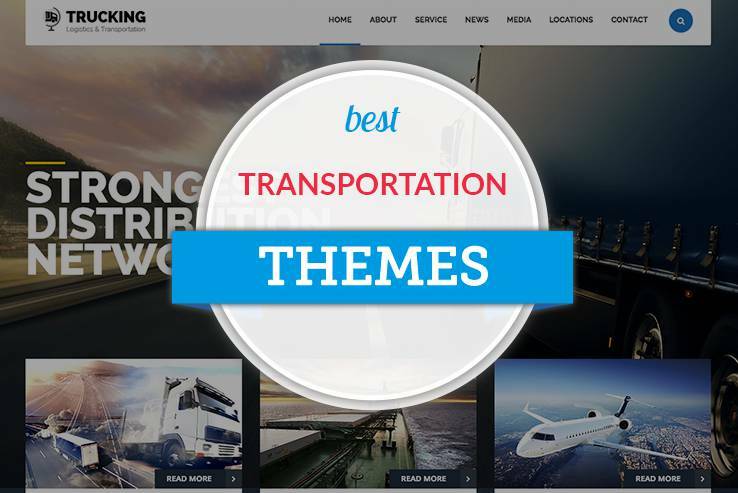 The theme is responsive and it has a significant number of headers catering to transportation companies. In addition, the Revolution Slider, Swiper, and Flex Slider plugins all come with your purchase. A responsive menu slides into place when clicked, and the translation options are essential for expanding your reach to customers all over the world. This is an SEO-friendly theme, and it offers various widgets and shortcodes. For example, some of the widgets include support for Flickr, Twitter, Instagram, popular posts, and recent posts. Some of the shortcodes produce areas for the following: Blogger, Lense, content sliders, and video lists. 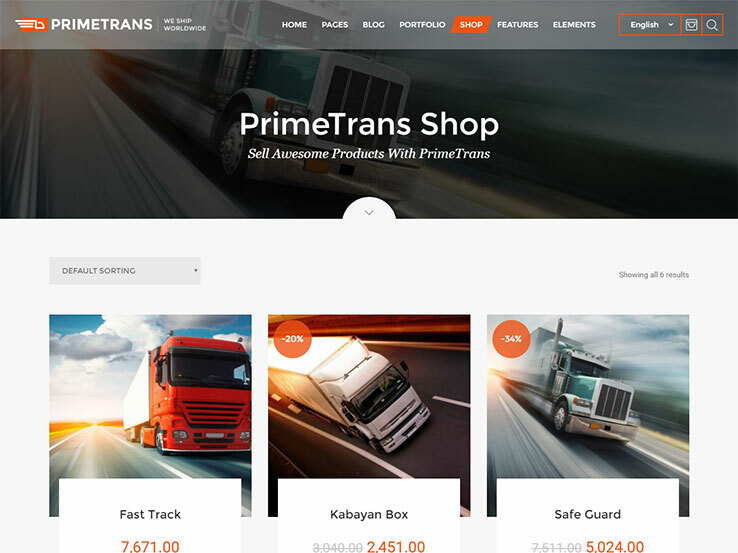 The Prime Trans theme delivers a sleek and stylish website configuration for trucking and transportation companies, with a responsive display and tools for combining with WooCommerce. The multilingual nature of the theme is helpful, while the Visual Composer plugin has drag and drop elements for designing. The various shortcodes insert items like sliders, maps, timelines, testimonials, and timers. The one click demo installation serves as a nice starting tool, and the powerful Ninzio slider packs in features like overlaying text and animations. Choose from unlimited colors and fonts, and take advantage of the one page and multi-page layouts. The advanced header styling allows for hover effects and various different colors, while the smooth parallax effect makes your company look more creative. Video backgrounds are possible, and it’s recommended you take advantage of the MailChimp integration. 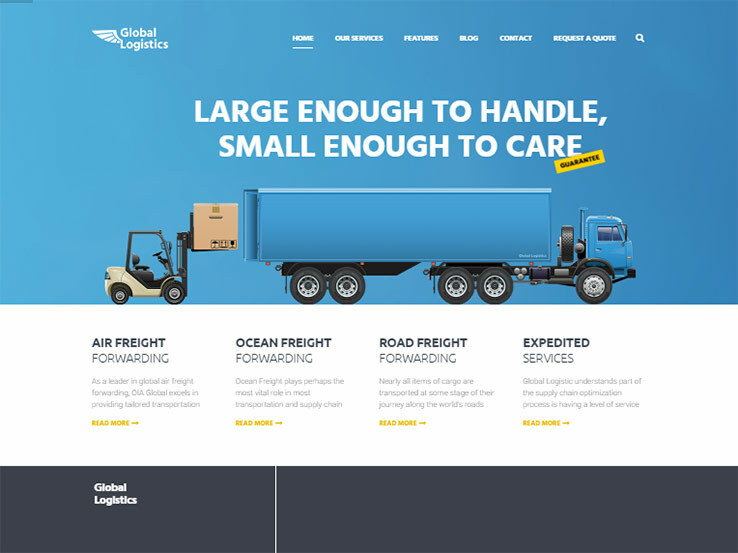 If you need a logistics theme that’s complemented by dozens of homepage and content pages, the Global Logistics theme might be the one for you. This impressive theme gets you started on the right foot with the homepage layout options, and all of the drag and drop elements work nicely with its responsive design. A few of the many drag and drop page elements include post grids, call to action buttons, and FAQs. The WPML translation tools boost your chances of finding new customers, no matter what language they speak. The custom background and header sections are rather unique in terms of customization, since you can change around colors, typography, or even the parallax effects. Choose from unlimited colors and skins, and don’t forget about the over 1,300 true retina type icons. Along with free support and updates, SEO optimization and video tutorials, the Global Logistics theme is one to consider if you’re running a serious transportation business. Awesome themes collection. Transport is my favorite WordPress theme.